Apple becomes the focus of the technology universe on Wednesday as the world awaits a new iPhone 8 Plus. According to YouGov's New Product Launcher (NPL) tracker, 21% of UK consumers attempt to buy the new iPhone. More impressively, 67% of current iPhone owners are considering upgrading to the iPhone 8 Plus in the near future. Why iPhone 8 Plus goes down a storm with UK consumers? This is because leaks and rumors portray the new iPhone as having a larger touchscreen than its predecessor, with quad-core CPU and life-extended battery. In other words, it will be more convenient to enjoy videos on the iPhone 8 Plus especially when you are on a long boring flight. However, like a blemish in an otherwise perfect thing, although iPhone 8 Plus is rumored to have 5.5-inch screen, the new generation of iPhone retains the same video specs as the previous version, only supporting such a few video formats as MP4. In this case, if you want to watch videos on this new iPhone 8 Plus, it’s intelligent to find and download a video converting software to get what you want. MacX Video Converter Pro - convert any videos to iPhone 8 Plus (iPhone 7s/Plus/7/6s/6/Plus) with 5X faster than any other converters and no quality loss. Although there are many video encoders flooding in the market and claiming to convert videos to iPhone 8 Plus that offers a larger touchscreen, they may sometimes let you down as some programs may be at a loss in terms of dimension and video scaling. 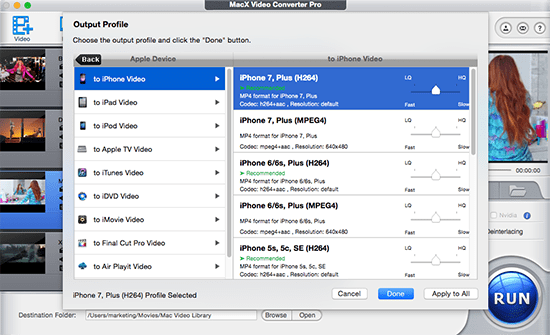 Well, never mind, MacX Video Converter Pro brings you a good solution to convert any videos to iPhone 8 Plus (iPhone 7s/7/6s/6/SE/5s) supported formats like MP4, M4V with few clicks. This video to iPhone 8 Plus converter is especially designed for Mac users and works perfectly in converting between HD videos like MKV, AVCHD, TOD, etc and SD videos such as AVI, MOV, FLV, MPEG, MP4 for compatible with QuickTime, iMovie, iTunes, etc. More importandly, you can free download this iPhone video converter to enjoy the No.1 fast speed as it takes advantage of Intel's QSV hardware acceleration tech. After free download video to iPhone 8 Plus converter on Mac (El Capitan); PC users can also get the windows (10) version, launch this video converter, click "Add Files" to load the video you want to convert. Choose "To iPhone" as output format for converting video to iPhone 8 Plus supported video format. This program also helps to convert video to iPad Mini 4, iPad Pro, iPod, Apple TV, Blackberry, Android, Music, and so on. Click "RUN" button to start converting video to iPhone 8 Plus. You can view the conversion progress and cancel the converting process at anytime on your Mac. Note: besides putting videos on iPhone 8 Plus, this downloaded program also serves as an excellent YouTube downloader, which is specialized in downloading and converting video from YouTube, Vimeo, Vevo, Dailymotion and 300 more sites to video formats like MP4, MOV, MPEG, FLV, AVI and portable devices such as iPhone, iPad, iPod, and so. Therefore, you can enjoy any YouTube videos offline on your iPhone 8 Plus anywhere anytime. Which is the best one to convert video to iPhone comparing with input output files, fast speed, features, ease of use etc. Read this reviews article about best iPhone video converter comparisons to get better advices. Best iPhone 7 video converter to easily encode videos to iPhone 7 (iPhone 6/Plus iPads Android included) in 1080P, 4K 2160P, 8K 4320P MKV, MTS, AVI etc with top quality and 83 x faster speed. Deeply troubled by some video transcoding software that doesn't work properly for you? Find the best software in the guide to convert FLV, AVI, WMV, MKV, etc to iPhone 6 and iPhone 6 Plus readable format easily.